For me, the most rewarding part of having my stories published is being able to share them with groups of children. As a former teacher, I have experience of teaching all primary school age groups, from Nursery classes to Year 6, and my reading sessions are light-hearted and fun. 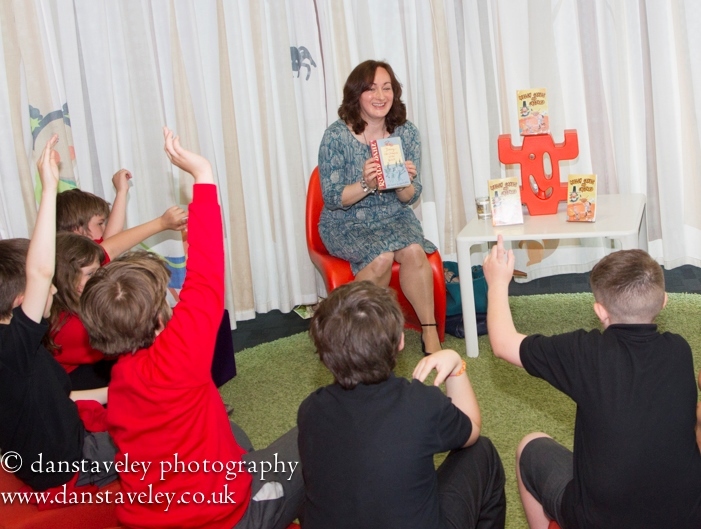 Sessions with younger children are based on Mamgu’s Campervan, Welsh Cakes and Custard and Three Cheers for Wales, as this is the age group that those books are most suited to. For older children, sessions are based on my novel St David’s Day is Cancelled. My fees are based on the standard recommended fees suggested by Literature Wales and the Society of Authors. Help with fees may be available from Literature Wales. For details and for bookings, please get in touch via the Contact Me page. Below is a flavour of what I usually do, but I am flexible and happy to adapt to whatever’s preferred. I introduce myself and the characters in the books, before reading two stories, with the help of some props and lots of audience participation. I narrate a role-play of Good Job, Emyr Rhys, where children act out the parts of Emyr Rhys, Da-cu and Nain. 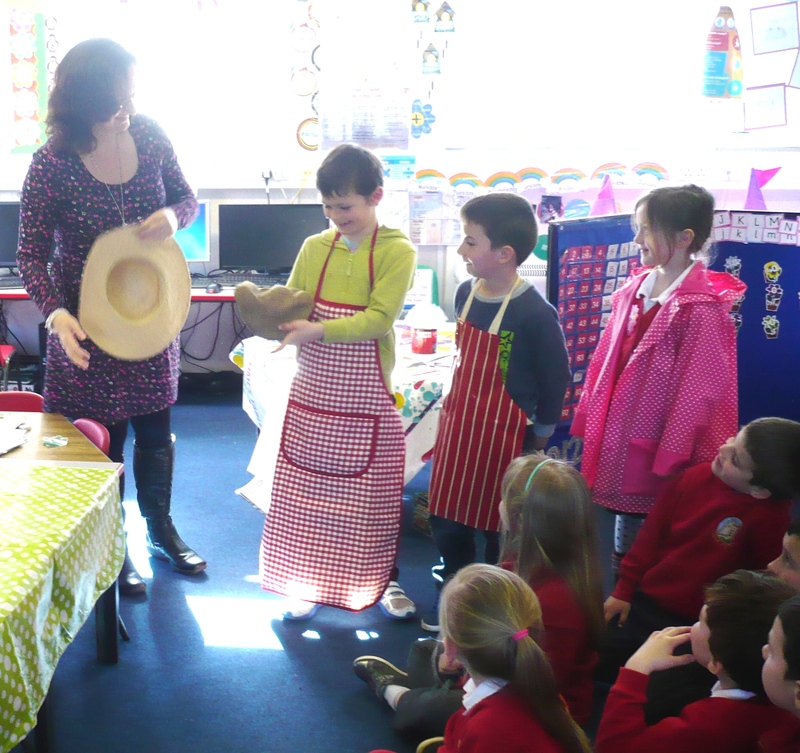 Emyr Rhys and Da-cu make Welsh cakes – using fake, non-messy ingredients – and try to tidy up before Nain comes home. Hectic and great fun! I tell the children a little about myself as a child, and how I became a writer. I also invite questions from the children. The whole session takes around one hour. I am happy to bring copies of my books to sell and sign after the session. Parents will need to be informed beforehand of the opportunity to buy books – I can supply a template letter which includes details of my books. I introduce myself and explain how I began writing stories. I talk about the process of being published, from the initial idea to the end product, and share the first drafts of my latest novel St David’s Day is Cancelled. I read from my latest novel and invite questions from the children. The whole session takes around one hour. I’m happy to bring along copies of my books to sign and sell afterwards. Parents will need to be informed beforehand of the opportunity to buy books – I can supply a template letter which includes details of my books. 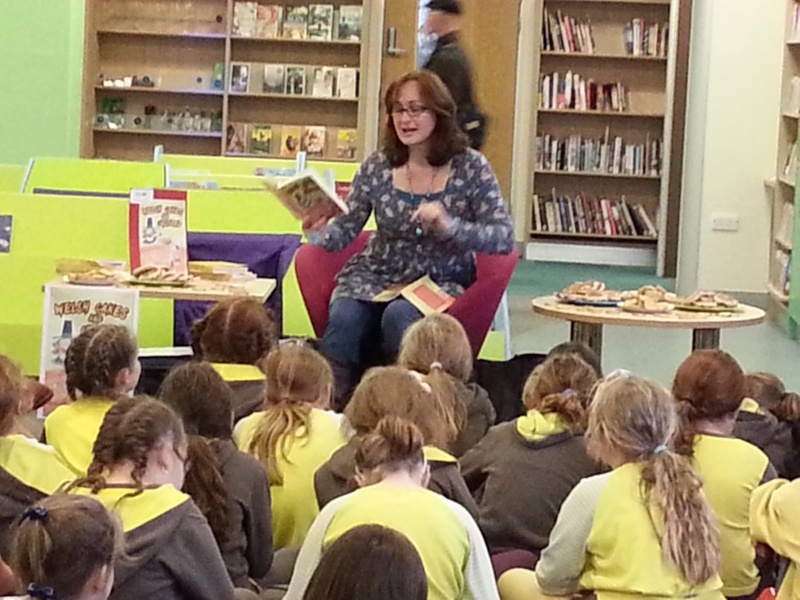 I am happy to come along and read my stories at children’s clubs, e.g. Rainbows or Cubs. I’m also happy to read my poetry and to speak generally about writing to adult groups, e. g. Mothers’ Union, Women’s Institute or writing groups. If you would like me to visit your club or group, please get in touch via the Contact Me page.